Breakeven prices are used to examine the relative profitability and competitiveness of a farm’s enterprises and when developing marketing plans. What costs should be included in the computation of breakeven prices? Do the costs included mimic those found on a farm’s cash flow statement? Should opportunity costs be included? This article discusses the costs that should be included in enterprise budgets and illustrates breakeven prices for corn and soybeans on high productivity soil in Indiana. The format of the enterprise budget presented below closely follows that of the Purdue Crop Cost and Return Guide. The Illinois crop budgets use similar cost items, but are laid out differently. Both budgets use all costs, thus breakeven prices could be computed using either budget layout. Most enterprise budgets use economic costs rather than cash costs. This means that, in addition to cash costs and depreciation, opportunity costs are included. An opportunity cost represents the income that could have been earned if an input was sold or rented to someone else. Opportunity costs for unpaid family and operator labor, owned machinery, and owned land need to be included in an enterprise budget. Because opportunity costs are included in an enterprise budget, the bottom line figure (i.e., earnings or losses) represents an economic profit or loss. Over a long period of time, due to the fact that all inputs (cash items, depreciation, and opportunity costs) are being paid the market rate, economic profit is zero. If economic profit is positive, input prices will be bid up, similar to what happened to cash rents from 2007 to 2013, and economic profit will migrate towards zero. Conversely, if economic profit is negative, input prices will decline, and economic profit will head towards zero or breakeven. As noted above, opportunity costs are typically included in enterprise budgets. Why is this the case? There are two good reasons why opportunity costs should be included in enterprise budgets. First, if we want to benchmark a farm’s costs to those from other farms, it is important to include both cash and opportunity costs in your enterprise budgets. The reason for this is straight forward. If your farm owns 50 percent of your crop acreage and the farms you are comparing with only own on average 25 percent of their crop acreage, you would not be comparing apples to apples if you did not include opportunity costs for owned land when making the comparisons. Similarly, if your farm does not have hired employees and the farms you want to compare with obtain 50 percent of their labor from hired employees, you would not be comparing apples to apples if you excluded opportunity costs for operator and family labor when making comparisons. Second, by including opportunity costs in your enterprise budget you can determine whether you are fully covering the costs of all inputs. For instance, you would like to know what return you are receiving for your owned land and machinery. You also would like to know what return you are earning for the time you spend working for the farm. Opportunity costs are particularly important for overhead costs (i.e., land costs, machinery ownership costs, and operator and family labor costs). With this in mind, we will provide some hints on how to compute opportunity costs for these items. For owned land, we suggest using market cash rent. For machinery and equipment, you can approximate depreciation and interest cost (referred to as machinery ownership cost in the Purdue crop budgets) using crop machinery investment per acre. Specifically, you can compute depreciation by dividing crop machinery investment by the average length of life of your machinery and equipment, and interest by multiplying crop machinery investment per acre by an intermediate term interest rate. Of course, these are only proxies for machinery ownership costs. More detailed computations could be obtained using a management or economic depreciation schedule. These schedules are typically provided to farm management association members. Finally, for operator and family labor, we suggest dividing the portion of business withdrawals attributed to crop production by crop acres. Family living expenses typically represent a major proportion of business withdrawals. However, some farms also withdraw money from the farm and use it for other businesses or investments. These funds should also be included in the opportunity cost computations for operator and family labor. Table 1 presents an enterprise budget for rotation corn on high productivity soil in Indiana for 2018. Trend yield multiplied by the expected harvest price results in a market revenue of $803 per acre. Harvest price was based on opening future price on April 10 and was adjusted for projected basis. Costs are presented on a per-acre and a per-bushel basis. Both of these figures can be useful when examining a particular cost item. Per-acre costs are typically easier to benchmark (with other farms or using historical information for the same farm) while per-bushel costs are extremely useful in examining the impact on a particular cost item when making a change that impacts yield per acre. 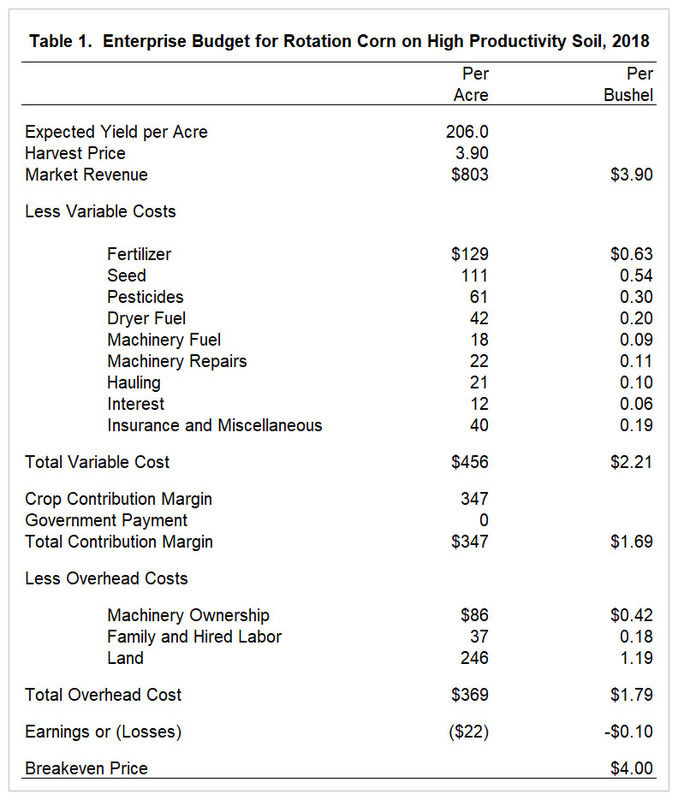 Total variable cost is $456 per acre ($2.21 per bushel). Variable cost represents approximately 55 percent of total cost. Subtracting total variable cost from market revenue and adding government payments yields an expected total contribution margin of $324 per acre. For the enterprise to breakeven, the total contribution margin needs to be at least as large as total overhead cost. For 2018, the total contribution margin for rotation corn is expected to be smaller than total overhead costs, resulting in a loss per acre of $22 or $0.10 per bushel. Breakeven price is computed by adding total variable cost to total overhead cost, subtracting government payments, and dividing the result by expected yield per acre. Breakeven price for corn is estimated to be $4.00 per bushel. The breakeven price reported in table 1 is sensitive to changes in yields, prices, and cost estimates. Trend yield was used in table 1. Using a trend yield, rather than last year’s yield or the highest yield achieved in recent years, is prudent when developing enterprise budgets. That does not mean that we can’t examine the impact of a higher yield. For example, a 10 percent higher yield, holding costs constant, would result in a $0.36 per bushel reduction in breakeven prices. We can also examine the impact of changing one or more cost times. Along these lines, a 5 percent increase in land cost would increase breakeven price by $0.06 per bushel or 1.5 percent. Table 2 presents an enterprise budget for rotation soybeans on high productivity soil in Indiana for 2018. Trend yield multiplied by the expected harvest price results in a market revenue of $636 per acre. Harvest price was based on opening futures price on April 10 and was adjusted for projected basis. Variable cost is $264 per acre or $4.19 per bushel. Variable cost represents approximately 42 percent of total costs, which is 13 percent less than that for rotation corn (table 1). After subtracting total variable cost from market revenue and adding government payments, total contribution margin per acre is $372. The contribution margin for soybeans is slightly higher than overhead costs indicating that overhead costs are expected to be covered in 2018. Expected earnings are $3 per acre or $0.05 per bushel. Breakeven price for soybeans is estimated to be $10.05 per bushel. The breakeven price for soybeans reported in table 2 is sensitive to changes in yields, prices, and cost estimates. As we did for rotation corn above, we will examine the impact of an increase in yield and an increase in cash rent on soybean breakeven prices. A 10 percent increase in yields would reduce breakeven price by $0.92 per bushel. A 5 percent in cash rent would increase breakeven price by $0.19 per bushel or 1.9 percent. Notice that the percentage increase in the breakeven price for soybeans resulting from a 5 percent increase in cash rent is higher than the corresponding increase in the breakeven price for corn. This is due to the fact that overhead costs on a per-bushel basis are relatively more important for soybeans than corn. It is important to note that opportunity costs for unpaid family and operator labor, owned machinery, and owned land are included in tables 1 and 2. If we want to compare revenue, costs, and earnings between farms; it is important to include these opportunity costs. Also, if we want to gauge the return to operator time and owned assets, these opportunity costs need to be included in enterprise budgets. The negative earnings or losses per acre depicted in table 1 for corn suggests that owned assets are not receiving market rates of return for this crop. As a final note, in addition to estimating breakeven prices, enterprise budgets can be used to make cropping decisions for the upcoming year. The contribution margin for both crops is positive. In the short-run, a farm should continue to produce if it is covering variables costs (i.e., the total contribution margin is positive). In the long-run, all costs (variable and overhead costs) need to be covered. The higher contribution margin for soybeans does not imply that the farm should produce all soybeans. It does, however, imply that the farm should consider producing both corn and soybeans, rather than focusing on corn. This article discussed the costs that should be included in enterprise budgets and illustrated breakeven prices for corn and soybeans on high productivity soil in Indiana. Components of the enterprise budgets for corn and soybeans included gross revenue, variable costs, contribution margin, overhead costs, and earnings or losses. Costs should be computed on a per-acre and a per-bushel basis. Using the information in this article, breakeven prices for corn and soybeans for 2018 were projected to be $4.00 and $10.05, respectively. 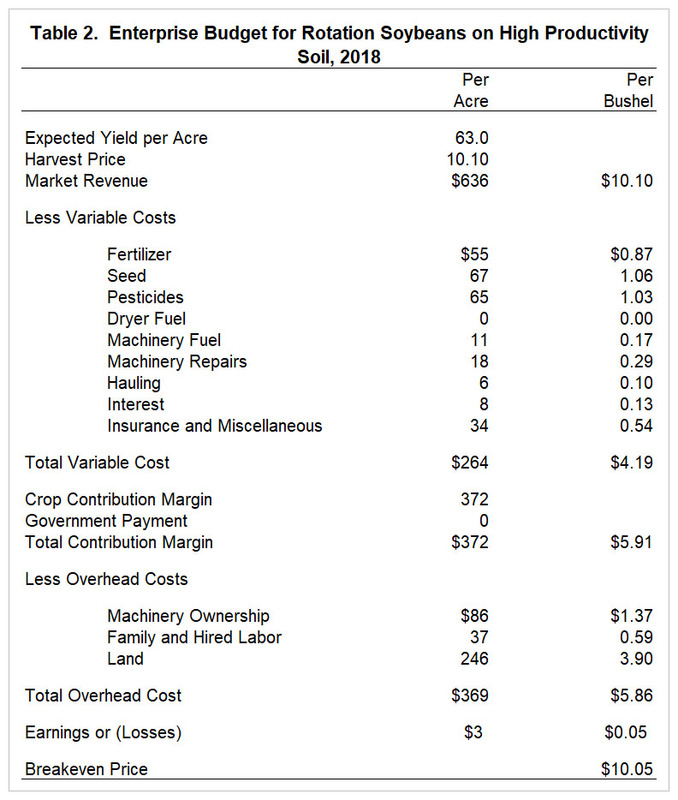 Due to differences in yields and costs, farms should compute breakeven prices for their operations and compare to these benchmarks. Purdue Center for Commercial Agriculture. Purdue Crop Budget Archive. https://ag.purdue.edu/commercialag/Pages/Resources/Management-Strategy/Crop-Economics/Crop-Budget-Archive.aspx. Schnitkey, G. "Crop Budgets, Illinois, 2018." Department of Agricultural and Consumer Economics, University of Illinois at Urbana-Champaign, February 2018. What are the Start-Up Challenges Associated with Farm Growth?